This product is from our marketing departments demo inventory. There is only one unit available. It is in gently used condition. The study of force is critical to many science explorations. An accurate and rugged sensor will ensure your students get the most out of their force experiments. An overload stop in the force beam and a polycarbonate plastic case protect our unit from student abuse. Easy to zero – just press the button and the zero setting is stored digitally. No confusing manipulations of data are necessary. Measures forces in the direction of the sensor – side forces are minimized. Need greater resolution? 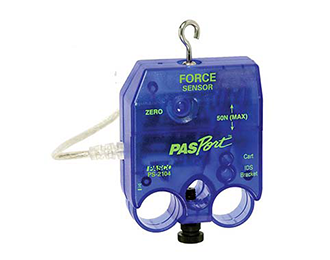 The PASPORT High Resolution Force Sensor is also available.